Team Rwanda had an early start this morning as we headed off to Ndera primary and secondary schools to take part in Umuganda, which means contribution, and is held on the last Saturday of every month. 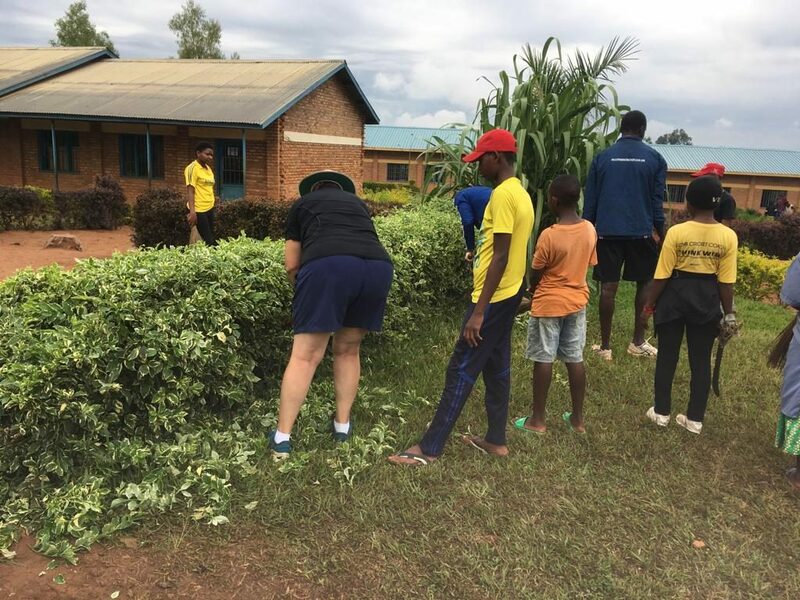 The people of Rwanda go around helping their neighbours, doing community projects, tidying the streets and in the case of Team Rwanda we were doing litter picking and a spot of gardening. 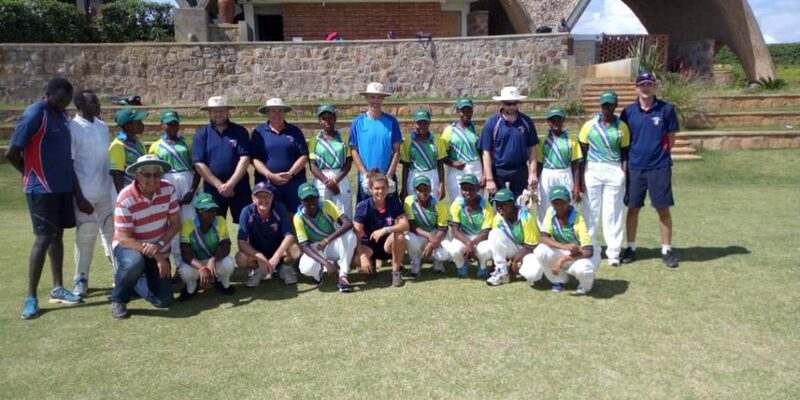 Accompanied by most of CWB ambassador Eric’s cricket teams and some local children we proceeded to tidy the school grounds and have some great conversations with the children as we did it. Finishing around 10.30 Eric suggested that we might like to do a bit of coaching with the children present and so we obviously we jumped at the chance, mindful that today we were playing at the national stadium and we certainly did not want to be late. Quick change at the hotel and off we went again full of excitement and arrived at the most picturesque ground you could imagine, bathed in glorious sunshine. 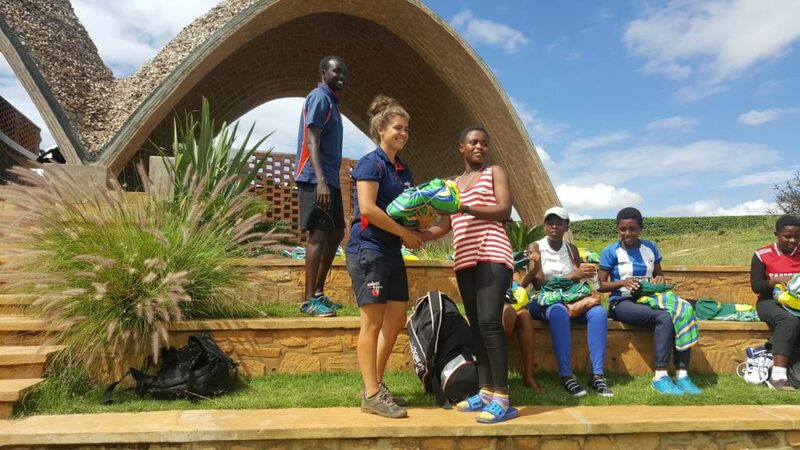 We were actually playing one of Eric’ junior Ndera teams and before the game started Ella presented each girl with a full playing kit which is part of a sporting link with Hampshire CCC and when they walked down the steps onto the pitch they looked fantastic in their Rwandan colours. Giles B. and Jamie opened the batting and what a start, Jamie hitting a 6 off the first ball and setting the tone for the rest of the innings, Jamie, Giles B. and myself all retired at 30 and there were excellent contributions from Ella, Mark and Kris. Special mention to Alex who came in at number 5 and I had the privilege of batting with as she scored her first ever runs. 171 was a daunting target for the Ndera girls to beat and with captain Ella rotating her bowlers the wickets soon began to fall and with the light failing we took the last wicket to give Team Rwanda a well deserved victory but credit to everyone for a most excellent game played in the true spirit of cricket. We had decided to have dinner at the ground with its wonderful views and Alex did sterling work in organising a curry to be delivered to the ground for us to have. Happily enjoying a beer before the curry arrived the lights at the ground and surrounding valley went out but in true CWB fashion we adapted quickly and we ended up having our dinner by mobile phone light amidst tall tales of our exploits during what was a very special day. Next Post Look at all the smiling faces…..